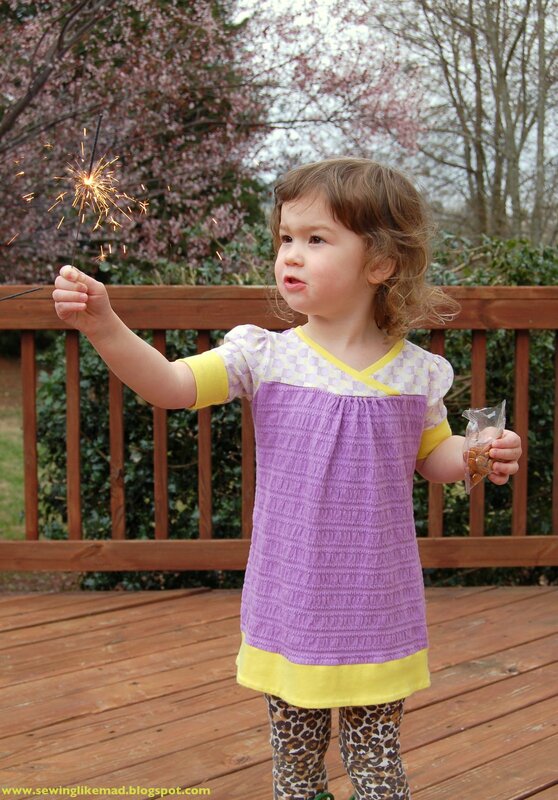 Sewing Like Mad: Hopscotch dress - tunic version. I just wanted to make this ultra short post (for a change) to show you this Hopscotch Dress from Oliver + S Patterns. I made it like 2 years ago for a friend's daughter, but when I tried it on Wilma before sending it, she refused to take it off (and I ended up making a completely different one to my fiend's daughter and this time I learned my lesson and made two!) AND now it is Evelyn's turn to wear it. It just hit me when she put it on how this is the ideal tunic length. Perfect to leggings. I wish I could tell you what size this is and if I changed the length when I sewed it but I honestly do not remember, sorry! 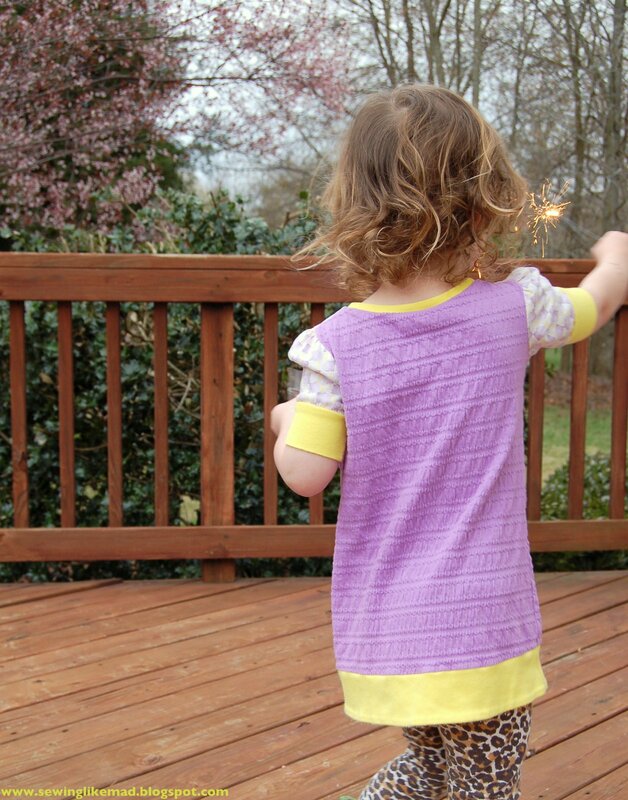 I changed the sleeve to a puff sleeve and added the wide yellow knit rib to finish the sleeve and hem. It is funny because I don't even like the purple knit that the body is made of but it totally works in this combination. 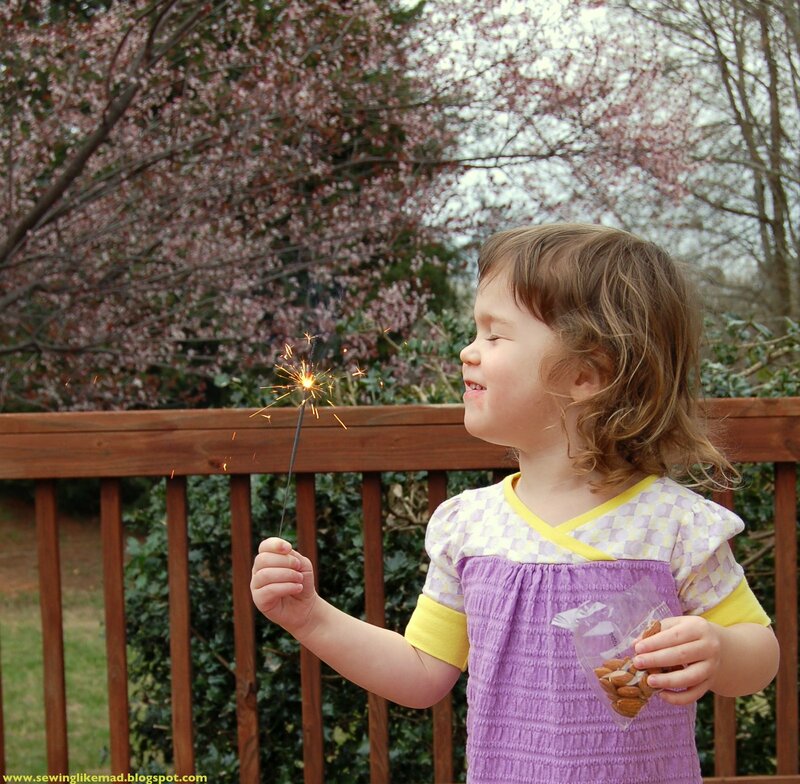 And I found a new way to photograph Evelyn....sparklers! And remember Google Friends Connect closes down in June and I don't want to loose you 85 sweet sweet people that it has taken me a full year to convince to sign up. So please consider switching to Bloglovin (see button in right side column). I have used that site myself to follow blogs for quite a while now and I can honestly say it is my favorite way to do so. And you can transfer your blogs from GFC to Bloglovin with a click of a button.....or two.....when you are signed up...which is also very easy.